Your cheapest quote beaten by 10% guaranteed! 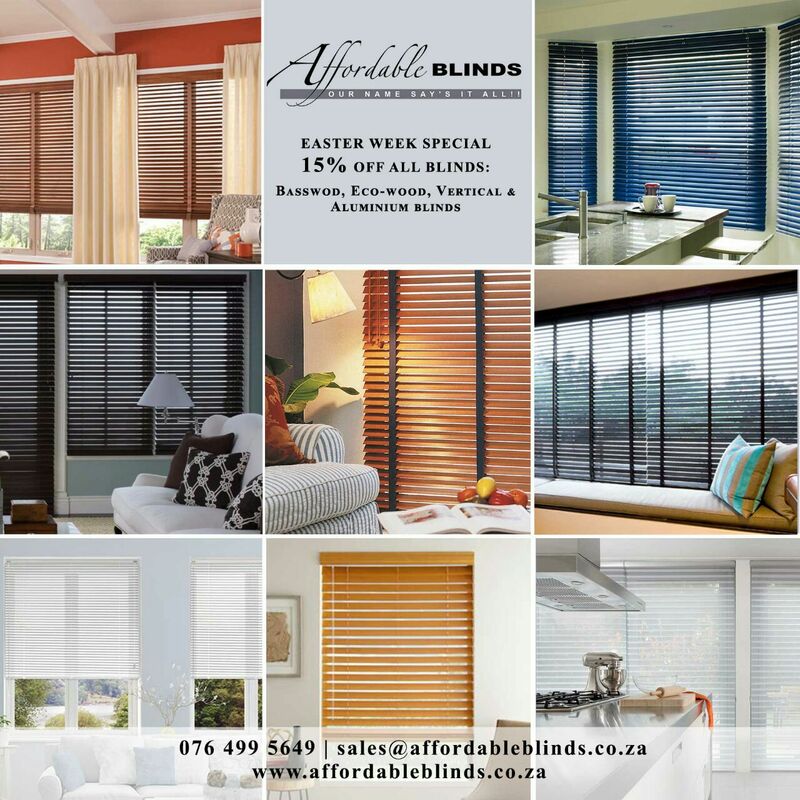 At Affordable Blinds we offer blind solutions to clients within the Gauteng area. Affordable Blinds has a name to live by, namely “AFFORDABLE” and to do this we therefore source quality blinds from reputable blinds manufacturers for your home or office. Affordable Blinds can assist you with all makes of window blinds – wooden Venetian blinds, aluminium Venetian blinds, Plaswood Venetian blinds (wood look alike), bamboo blinds, roller blinds and also vertical blinds . With a wide range of different blind products and also colours you can choose from. We are confident that we have what you are looking for. All your Window blind needs online. From vertical blinds online to Venetian blinds. A qualified consultant will be sent to you within 24 hours to give expert advice on products that best suits your needs and accurately measure your windows for a custom professional installation. As a result you can be sure the installation and custom build of the blinds will be perfect. Vertical blinds online – Affordable blinds. Another benefit is we offer evening and weekend quotations as well. We recognise the importance of the technological age and keep abreast of the latest in Blind Research but equally important, we believe it is the personal touch with your requirements on site that set us apart from other providers. We specialize in curtains and blinds. Can assist you with all types of window blinds. Venetian blinds are a sure favourite. Vertical blinds no hassle. Blinds Pretoria no problem for us and blinds Johannesburg at affordable prices. Our qualified consultants are online waiting to attend to your online quote needs. Please remember to provide your telephone number.